Dressing is the topping that makes a salad. Giving it zest and enhancing it's already delicious flavours, I love adding new flavours to my food and trying new things when it comes to meals my whole family can enjoy. 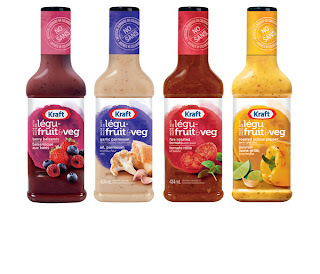 Kraft has always been a brand we enjoy in our house and this includes Kraft salad dressings. 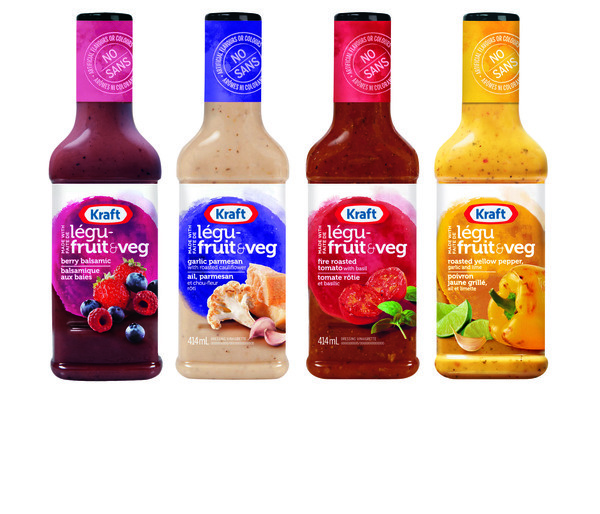 New Kraft Pourables Fruit & Veg Dressings are made with real fruits and vegetables with a bold, fresh taste! With no artificial flavours, colours or added preservatives and also low in fat and salt (only 25-30 calories per serving). Kraft Pourables Fruit & Veg Dressings make a better choice for everyday family meals. Kraft Pourables Fruit & Veg Dressing is more than just your everyday salad dressing though! With four taste bud tantalizing flavours like Berry Balsamic, Roasted Yellow Pepper Garlic & Lime, Fire Roasted Tomato with Basil, and Garlic Parmesan with Roasted Cauliflower you're bound to come up with something delicious with the help of Kraft! We enjoyed several different meals with Kraft Pourables Fruit & Veg dressings, including salad! One of our favourites was trying the Garlic Parmesan with Roasted Cauliflower on rice or over steamed veggies, so yummy! It's also very good on baked potato too! If you want something with a little more zest try the Roasted Tomato with Basil on your average house salad. One little recipe I tried was roasted potatoes with Garlic Parmesan with Roasted Cauliflower dressing! Peel, wash and cut your potatoes into slices or cubes (whichever you prefer). Put potatoes into a glass cooking dish and add a little vegetable oil (or margerine if you prefer) and as much dressing to your flavour preference. Make sure the potatoes are coated. Put a lid on it and pop it in the oven at 375* for 20-25 minutes or until desired tenderness. Simple and quick, this made a great side to chicken and veggies! I really like the variety of flavours available, whatever your meal - there's a Kraft dressing for it! You can find Kraft Pourables Fruit & Veg wherever Kraft salad dressings are sold at a grocery store near you! Visit the Kraft Canada website for more information about these and other great products available! For more food talk, Follow @KraftCanada on Twitter using hashtag #NewPourables! Disclosure: Sponsored post by AME on behalf of KRAFT in participation with SheBlogs Media. Information and images provided by KRAFT. Opinions and comments are those of the author. Great ideas Alyssa! I hadn't thought of it over steamed rice or veggies. Will have to try. I'm really interested in trying the Garlic Parmesan & Roasted Cauliflower dressing - it sounds so different! I am also impressed that they are pretty low in calories!